If you're in need of definitive evidence that human civilization is on a downward spiral, look no further than this. AutoExpress reports that the famed MGB roadster is due to make a comeback in a big way. And by big, I mean that it's going to be a crossover SUV, not a small sports car. 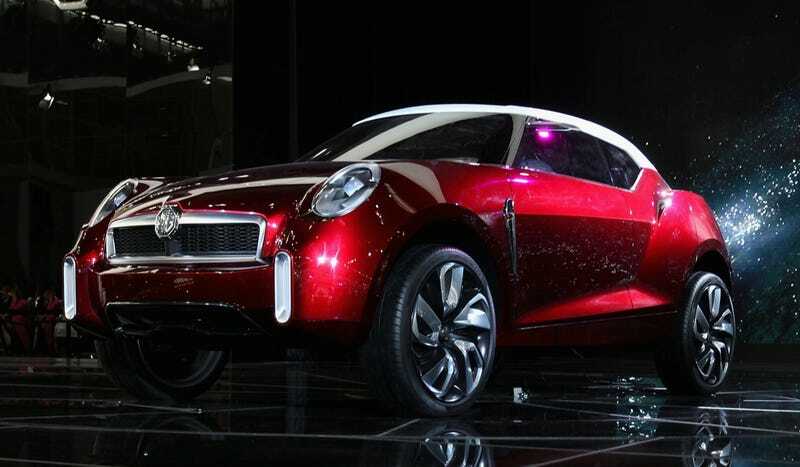 They have some concepts of how the car is supposed to look, but think of the MG Icon concept from the April Beijing Motor Show but without a roof and you'll be on the right track. "MG hopes to appeal to a new generation of enthusiasts with this modern-day interpretation of legendary sports cars like the MGB," AutoExpress says. "Our exclusive images show how the car could look, and it's set to be a huge hit for the reborn company." It's a hit alright. I feel like I was hit across the face with a baseball bat when I saw this. On days like this, boys and girls, I wish I was writing for The Onion and could simply make this kind of thing up as hilarious satire. Unfortunately, it is real. I guess it makes sense — someone has to build something that competes with the Nissan Murano Cross Cabriolet. Anyway, nobody tell BMW that MG is doing this. I have this weird feeling they will rush out to build droptop versions of the X5, X6, X3 and X1. Thanks for the tip Nibby4WD!